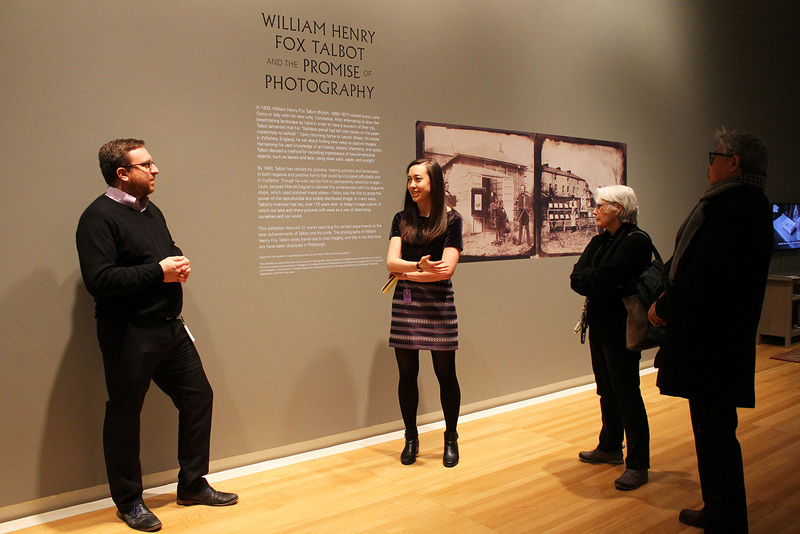 In early February 2018, a group of Pitt graduate students and faculty spent the afternoon talking all things Talbot with curator Dan Leers, during a special tour of the Carnegie Museum of Art exhibition, William Henry Fox Talbot and the Promise of Photography. Organized by Leers, the show brought together more than 30 works by British photographer William Henry Fox Talbot (1800 – 1877), making this the largest collection of Talbot photographs displayed in the US in the last 15 years. During the tour, Leers discussed his vision for the show, highlighting key moments from Talbot’s long career, as well as the difficulties in displaying such fragile objects. Talbot’s influence on the development of paper-based photography is undeniable, with his patented “calotype” process serving as a forerunner to the darkroom techniques that many photographers still use today. At the time, daguerreotypes reigned supreme, but required photographers to spend hours laboriously treating and polishing copper plates, and allowed for only a single image per plate. However, Talbot’s calotype process allowed for multiple prints and shorter exposure times, which in turn expanded the potential subject matter. One point that Leers highlighted in his talk, was the incredible range of subjects that Talbot tackled in the early years of his photographic practice. After reducing his exposure times from a few hours to just a few minutes or even seconds, Talbot set out to photograph the world around him, in an almost encyclopedic fashion. The photographs on display offer a broad sampling of Talbot’s interests, from landscape scenes, street views, and family portraits to pictures of ceramic bowls and glass vases, classical busts, botanical specimens, and even his mother’s treasured lace collection. He photographed the things and places that had captured his fascination early on as a young Oxford student, where he cultivated a passion for the arts, sciences, and the classics. As Leers reminded us, it was Talbot’s unceasing pursuit of knowledge and his role as a “gentleman scientist” that led to his innovations in photography – innovations that can be traced from this early moment in photography’s history through to today. For those who missed the show, which closed in February, do not fret. The exhibition was accompanied by a wonderful catalogue available online or through the Carnegie Museum of Art gift store, with brilliant reproductions of Talbot’s works, an introductory essay by Leers, and detailed captions by noted photo-historian and Talbot expert, Larry Schaaf. With Leers at the helm of the Carnegie Museum of Art’s Department of Photography, I have no doubt that we can expect more exciting exhibits to come, rousing more dialogues about the varied and far-reaching promises of photography.